The invitation to the White House Celebration of Filipino American Heritage month suggested business attire or Filipinana. What? 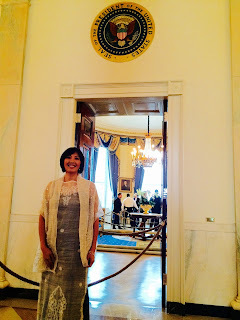 For this daughter of immigrants, this first generation American born girl, this on the ground and canvassing for President Obama two election cycles in a row volunteer, the thought of wearing Filipinana to the White House was the ultimate physical manifestation of being a hyphenated U.S. citizen. I had been to the White House on a number of occasions and I had been dressed in business attire. I had been all red, white and blue. Throwback to my elementary school days when everyone thought I was a foreigner. When I was bound and determined to differentiate myself from my Filipino cousins. I was a brown girl in a white world. I was going to fit in and ignore my Filipinoness. I would not be caught dead in a butterfly sleeved, barefoot dance between two bamboo poles garment if it was the last thing I would ever do. I wore Levis. I floated around in gauzy peasant tops. I wore clogs, for God’s sake. I ran to my closet to look for the perfect outfit. A dress that said I am Pinay—but modern and of U.S. citizenry. Two years ago, as I was planning my wedding to my White Southern Man (progressive and blue-eyed and beautiful), I asked Filipina dress designer, Bong de Ocampo, to make me a modern barong. I told her I wanted it to be long and sleek. A shift. No sleeves. I wanted a shawl. I wanted a dress that I designed myself. I was all set to wear it, even posted it on Facebook, when Hurricane Joaquin threatened the DC area. I would have to stand in long lines to make it through security and into the White House. I would have to hold a flimsy no-point umbrella over my head. No, said my comadre Bing Branigin from DC, wear something warmer. I had to think about it. For like a nanosecond. 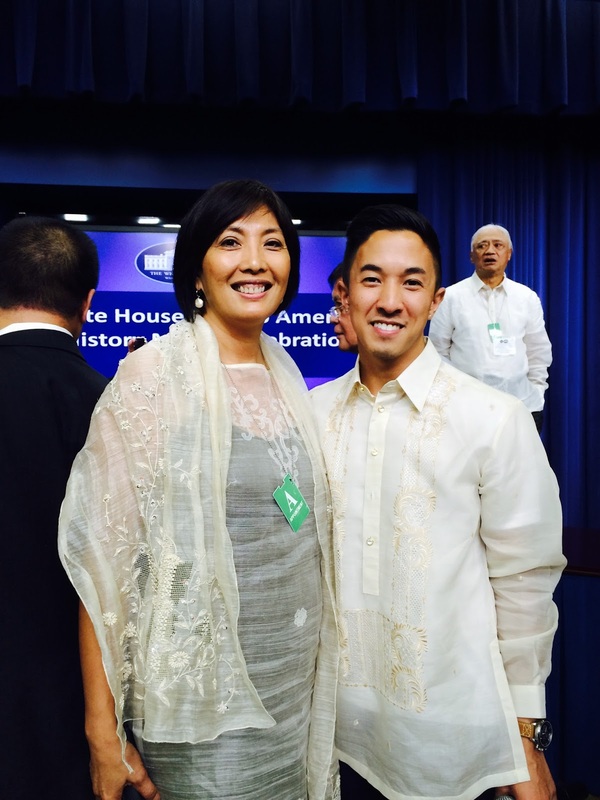 The White House was not only acknowledging Filipino American Heritage Month, it was celebrating it! I was invited to show my Pinay pride in the way I carried myself, in the way I took on my identity, in the way I wore that dress. I stood in the rain at least twice that day. The wind turned my White House-approved umbrella inside out. My long sheath barong was covered up to my knees in a sassy dress coat. The hem of my barong was soaked. My hair was damp, falling straight. I felt like a drowned rat. I was kissed by rain and it didn’t matter. The dress was a beautiful sampaguita from my garden in Miami—the pineapple weave shining like gossamer and the joy from inside me radiating all kinds of heat. Ako ay Pilipina-Americana taga Miami, one of the 4 million in the United States. Her Wild American Self had arrived. ... and you looked terrific!